The phone call came in December. There's a new shop in town, said my sister. I think you will like it. As she described it, I somehow knew I would indeed like it. Very much. Then came the tantalising month's wait until my holiday in Hamilton. I finally visited last week. 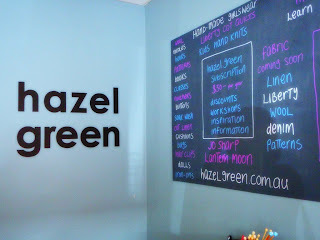 Jackie's gorgeous retail space and workshop, Hazel Green, in regional Victoria is beautiful. So spacious and serene. 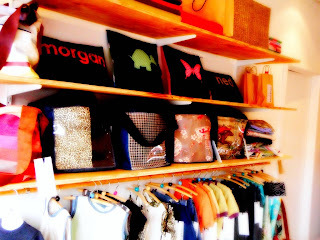 At one end are her divine handmade clothes, bags, quilts, cushions and dolls. 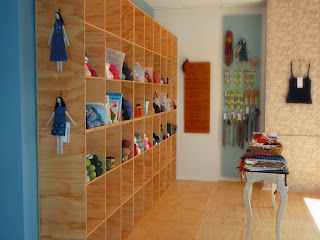 At the other, the most delicious selection of yarn by Jo Sharp. In between there's a nice big table where craft nights are held. 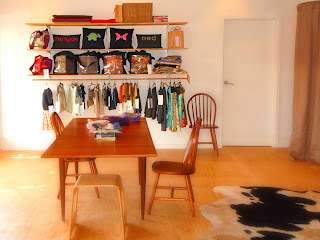 If you are in Hamilton, you really must drop in (be sure to look on the counter at the lovely vintage buttons). Or perhaps you could pop by her new blog and say hi. Keep an eye out .... there are good things happening over there. Oh that shop looks divine! Wish the in laws lived closer to Hamilton - I'd be there in a flash! Oh that looks so nice! Oh, I am salivating. Maybe I need to take the family on a holiday to Hamilton! What a gem of a shop. Looks dangerously nice Liesl, I will pop in if I am in Hamilton!